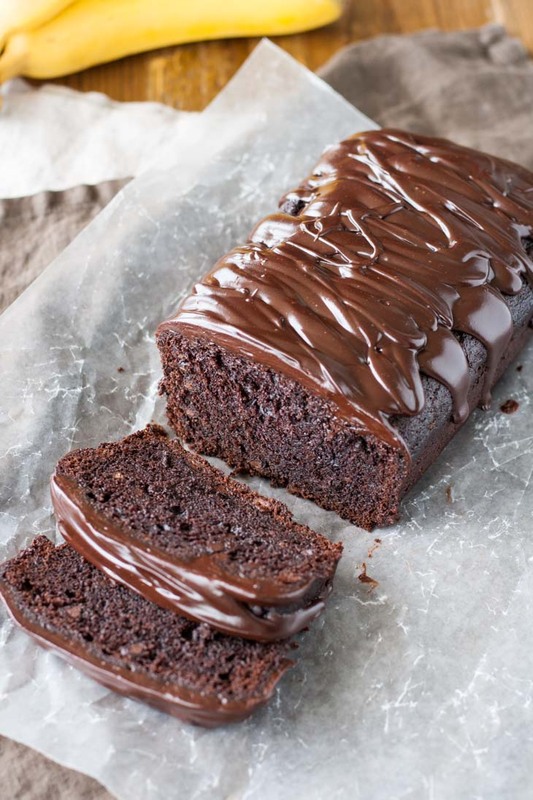 Easy, one-bowl Triple Chocolate Banana Bread. 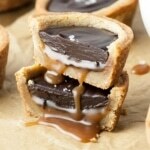 Loaded with chocolate chips and topped with a dark chocolate ganache. We have an excessive amount of bananas in our freezer. Really, it’s reaching epic proportions. I’ve mentioned before that I consider bananas to have a ridiculously short life span. There’s a 1-2 day window when I consider them edible. Anything outside of that is just… no. Ryan actually prefers them when they are (what I consider) over ripe, aka rotten. You know, when they start to have brown specks on them and the banana smell is WAY too strong. No thank you. It’s usually around this point that they get shoved into the freezer to be used at some undisclosed later date, almost exclusively in banana bread. I love banana bread. It’s so easy to make, and super versatile. 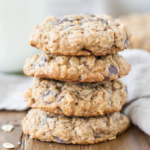 You can jazz it up with chocolate chips or pineapple chunks, add some walnuts or coconut – the possibilities are endless. You can have it for breakfast, as an afternoon snack, or even dessert. 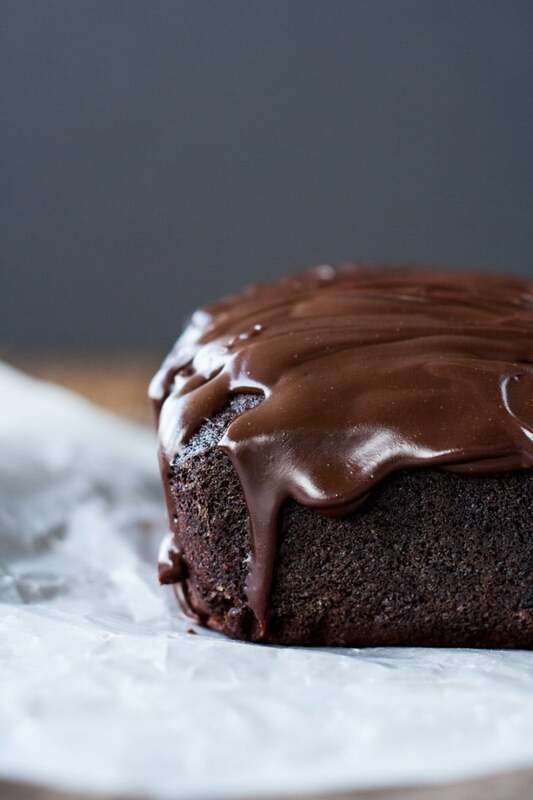 This triple chocolate banana bread most certainly falls into the dessert category (though I won’t judge you if you sneak a piece for breakfast). I have made banana bread before, and even fancied it up for a tropical Bundt cake (which was delicious), but I’ve never made a rich, chocolatey version, so that was my priority this week. 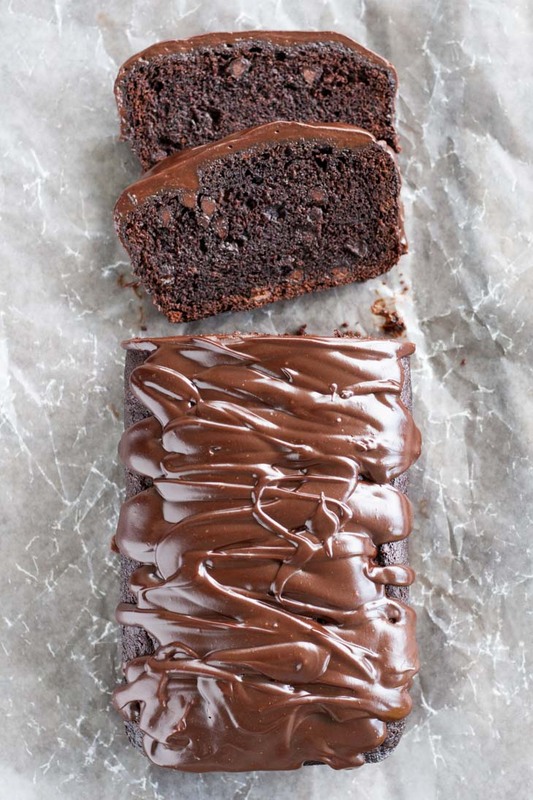 For this Triple Chocolate Banana Bread, I swapped out some of the flour for cocoa powder, and added some espresso powder to intensify the chocolate flavour. Adding espresso powder to chocolate baked goods is my favourite thing to do. You can’t often taste the coffee flavour itself, but it really adds a richness to the chocolate, which I love. I had some leftover ganache from last week’s Mocha Chocolate Cake, so I decided to kick this chocolate banana bread up a few notches – because it clearly wasn’t chocolatey enough already. I originally intended to sprinkle chopped walnuts on top of the ganache to help cut some of the sweetness, but I loved the pattern of the ganache drizzle too much to cover it up. 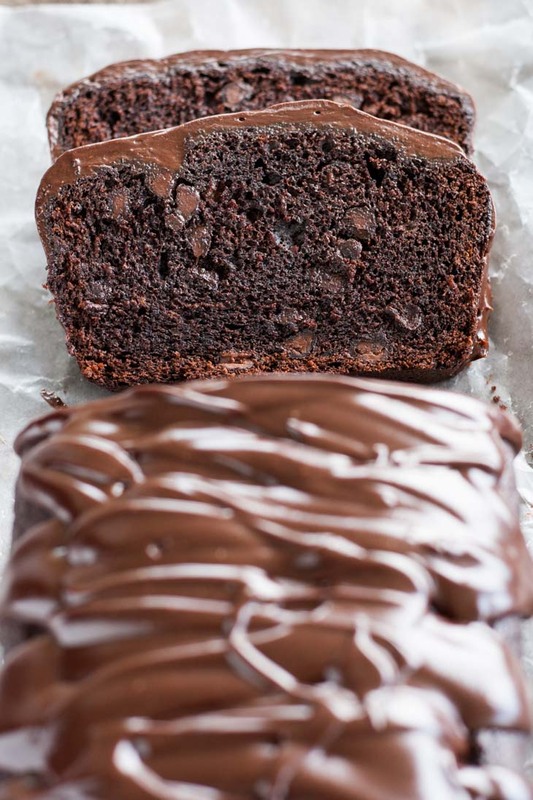 This triple chocolate banana bread is delicious. 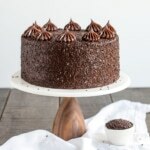 It’s incredibly moist and chocolatey. 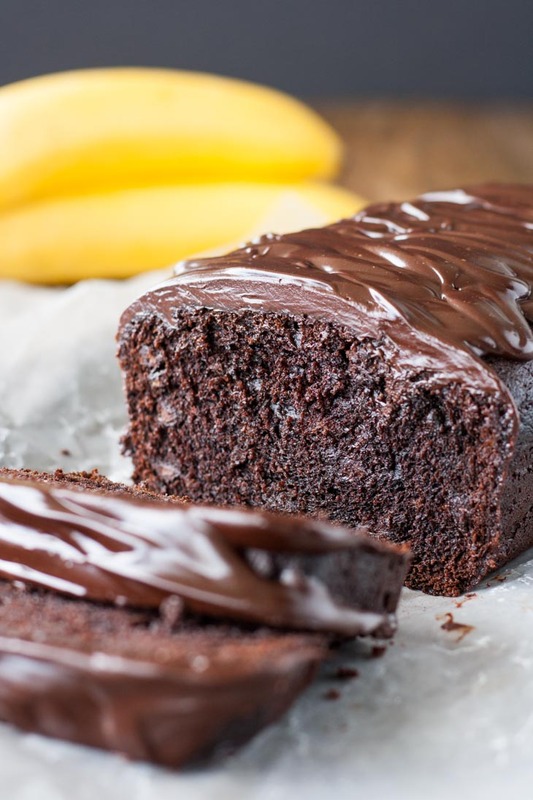 If you want to tone it down a bit (and I wouldn’t blame you), you can skip the chocolate chips and ganache and have a delicious plain chocolate banana bread. Or you can swap the chocolate chips for walnuts or some other kind of nut. Really, it’s so versatile and fun to experiment with different combinations. Whatever you decide on, you won’t be disappointed! Oh and the best part about this recipe? You can totally do it in one bowl. You can do this easily in one bowl, just add the dry ingredients directly into the wet instead of mixing them in a separate bowl. This bread is not super sweet and has a strong chocolate flavour. If you’d like to tone that down and prefer it sweeter, reduce the cocoa powder to 1/4 cup and increase the flour to 1 1/4 cups. I use Dutch-processed cocoa powder, but regular cocoa powder will work too. Preheat oven to 350F. Grease and flour a 9" x 5" loaf pan (I use homemade cake release). Line with parchment (optional). Add dry ingredients to wet and mix until combined. Fold in chocolate chips. Bake for 55-65 mins or until a cake tester comes out mostly clean. Cool in pan on wire rack for 10mins, turn out and cool completely on wire rack. Finely chop chocolate and place into a bowl. Bring cream just barely to a simmer and pour over chopped chocolate. Cover with plastic wrap and let stand 2 mins. Stir with a spatula until combined and smooth. *This bread is not super sweet and has a strong chocolate flavour. If you'd like to tone that down and prefer it sweeter, reduce the cocoa powder to 1/4 cup and increase the flour to 1 1/4 cups. **One-bowl method - Skip this part and just add the dry right into the wet. ***I had leftover ganache stored in the fridge that I zapped in the microwave for 30 seconds. I absolutely love this banana bread recipe, it is my go to recipe, always. I don’t usually do the ganache but it’s still amazing! Quick question, when making muffins can I use the muffin liners or should I spray the tin and flour it? Hi Michelle! So glad you like this recipe — either way should work for muffins! I don’t remember ever having a banana loaf as absolutely delicious as this one. I did sub semi- sweet chocolate chips in place of the milk chocolate chips and it was wonderful. Thank you, thank you, thank you. Hi there! Thanks for the great feedback, so glad you liked it!! Greetings from Argentina 🙂 I´ve made this and it´s absolutely delicious. Could I FREEZE this (in loaves)? Hi Eliana! So glad you like it! It should freeze just fine. I made this before but use the wrong chocolate for the top! Was disappointed! Gonna try it again!! Hi Kathy! Let me know how your next attempt goes! I forgot the chocolate chips is that ok?? I’m not a big banana person. Is there anyway to leave the banana out and it just be triple chocolate bread and taste ok? Hi Michael! No, that would be too drastic of a change for the recipe to work properly. can i use all purpose cream as substitute for whipping cream? I made this today as well. I followed exactly to the recipe. It’s super yummy and moist! Thank you so much! I am so so so gonna try more and more of your recipes. I made this today and my friend enjoyed it. It’s moist and yummy! Gave her some to take home for her daughter. When do u add the expresso powder? Hi Samantha! You add it in with the dry ingredients. Hey Olivia! I tried my hand at this recipe and it turned out amazing! It was moist and YUM! Hi Lale! I’ve never tried it without using an egg. There’s already a lot of banana in the recipe, so I’m not sure how that would work. Let me know how it turns out if you give it a try! Hi! I have baked this recipe twice now, and it is absolutely delicious, however I found that when I try to take the bread out of the pan, it completely falls apart! I’m new to baking, but I followed your instructions exactly and I’m not sure what I’m doing wrong! If I stick a toothpick in the center, it comes out clean so I’m not sure what to do! Hi Chan! I’m sorry to head about your troubles with this bread. It should be rather dense and not fall apart at all. Are you greasing and flouring the pan? And then waiting 10 mins after it comes out of the oven to remove it from the pan? That is so strange!! Are you using fresh or frozen bananas? I use fresh overripe bananas. This time however, I’m going to try to make it with frozen bananas! Lol! Too true 🙂 Thanks Tina! hi olivia.thanks for sharing. I tried this recipes and I like it so much…so, I used this recipes in my blog too. Hi Haniya! I’m so glad you liked this recipe. Please link to my recipe in your post! This bread/cake was perfect! I did your variation of more flour, less cocoa powder for a sweeter loaf and it was perfect! I LOVE the balance of banana and chocolate. I made sure not to mash the bananas too much because I like chunks of banana in my bread. 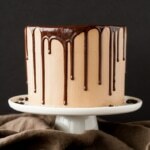 I also did the ganache, but used milk, butter and chocolate since I didn’t have heavy cream. SO good and the neighbors loved it too! I sent my friend the link, and her husband told her she needed to write it down, haha! Thanks for posting!! Hi Olivia, what temperature and how much time would you bake this bread in muffin tins? Hi Stephanie! I would bake them at the same temperature and maybe start checking them at 2omins! Love Love Love!! I followed your instructions to reduce cocoa and increase flour. WOW! I don’t like things too sweet…so it was perfect. But hey it was done in half the time for me…a 9 inch loaf pan…just measured. Thankfully I kept an eye but not complaining :). PS: The first time ever that I am leaving a comment on any blog. Made this cake. What can I say – another cracker! My oversupply of frozen bananas is now diminished. Based on previous comments, I used “lady finger” bananas which are quite sweet and substituted some of the oil for apple sauce. 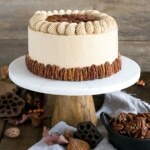 The cake was light and delicious, will be making this one again. Awesome! Good call on the applesauce, I’m going to try that in a few recipes soon :). It’s a never-ending stream of them going into my freezer it seems! I hope you love this recipe :). Saw the picture of the cake and made it. Very easy recipe to follow. The cake was very nice but I found it a bit to oily. Is it possible to reduced the oil quantity? . Definitely will make it again. Hi Iris! You can try reducing the oil for sure. Try 1/2 cup next time and see? Alternatively, you can use butter and cream it with the sugar before adding the rest of the wet and dry. Let me know how it turns out! Do you have a recommendation for what kind of dark chocolate I should get? Are you talking about semi sweet chocolate chips, a dark chocolate candy bar like Hershey’s? Everyone I ask says any good melting chocolate that you would eat? But that doesn’t help since I don’t eat dark chocolate on it’s own. Please help! Hi Joey! Great question. You can really use any chocolate for this, but it will taste better if you get a higher-end brand. I typically use Callebaut because it’s easily available to me, but a more common brand like Lindt would work well too. In a pinch, Hershey’s or semi-sweet chocolate chips would totally work, but the high quality stuff would taste better (my personal opinion) and give a smoother ganache overall. Hope this helps! Oh. My. Gosh. 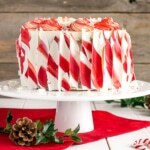 I can’t wait to try this it looks AHmazing! Thank you for sharing! Thank you! I hope you like it :D.
I had the exact same problem. It was bitter and salty and just didn’t taste right. I used 100% cocoa powder, Dutch processed unsweetened. Could that be it? Bananas were ripe with black spots outside, but definitely not gooey. May be that’s why? Oh well, here’s to tweaking and giving another try! I also use Dutch-processed unsweetened, so I’m not sure that’s the issue. Hmm. I just went and tried a piece because I still had some in my freezer (hah!). It’s not an overly sweet bread, but that’s the way I like it :). It has a pronounced banana and chocolate flavour. If you’d prefer it sweeter, you could try adding another 1/4 cup sugar and skipping the salt, or reducing the cocoa powder by 1/4 cup and subsequently increasing the flour by 1/4 cup. Yep, figured the exact adjustments that you mentioned. It turned out much better! Also replaced dark choc chips with milk ones. Thanks for the advice! Do you freeze the cake?? Does it not harden to a brick? I was thinking how to store it so that it doesn’t dry out. Do you cover it with something? I do freeze stuff, all the time! Generally I slice everything up, place parchment between each piece, and store it in an airtight container. Once frozen I sometimes transfer to an freezer ziplock bag. Stuff won’t last forever for sure, but a few good weeks (sometimes months depending) :). If you plan to eat it within a few days, I would wrap it in plastic wrap and store it in the fridge. The fridge isn’t great for baked goods, as it will dry them out (unlike the freezer), but it won’t go bad as fast if you left it on the counter. It would survive fine on the counter for a couple days (wrapped), unless you’re in a really hot climate! Oh and if you do freeze it, you can take it out slice by slice and thaw it on the counter (or nuke it in the microwave if desperate 🙂 ). I made this bread yesterday since I’m always looking for something new to make using the overabundant amount of bananas I have at home. It looks really promising at first but when I baked the bread, I thought it was weird that the oven didn’t have the usual sweet aroma when baking until the last 10 minutes and I got worried. When I took it out of the oven and let it cool, I ate a slice and was a bit disappointed. It was bitter and I couldn’t really taste anything but cocoa powder and trace amounts of espresso powder. Since I didn’t use ganache, I was hoping it would be a bit more sweet as a standalone bread. For the record, I used all the ingredients that were optional besides the ganache. Today I ate another piece and it tasted better than the first time. It was very rich, moist and bitter like dark chocolate which I liked (I really love chocolate!) so it wasn’t a bad thing; I can appreciate the taste now! However, my family couldn’t appreciate the taste and so I now have to eat the whole rest of the loaf myself, but I’m not complaining! All in all it’s a good recipe, but maybe next time I will substitute the brown sugar for white sugar to make it sweeter to taste. Thank you for the recipe, it’s always good to try something new! Hi Karen! Thanks for your feedback. I’m surprised that you didn’t find it sweet! To me, the banana bread isn’t sweet like a cake, but it’s definitely sweet, especially with the chocolate chips! I’m curious, what kind of cocoa powder did you use? I’m not sure what else could have caused the lack of sweetness other than bananas that weren’t quite at the over-ripe stage. Hmmm. At any rate, I’m glad you ended up liking the recipe after all! Too bad your family didn’t, but like you said, more for you! :). The most decadent banana bread ever! Chocolatie but not over sweet! Rich and moist and good for you! Gahhh… my kinda bread. Chocolate!!! What is espresso powder and where in the supermarket would I find it?? It’s a type of instant coffee, you can find it in the coffee aisle or order it online! I use the Nescafe brand one :). Omg! That looks so good. I am trying to diet and this really calls me!!! Too much chocolate? Never! I am going to convert this to a muffin recipe and do this for the kids at the daycare fund raiser. I also live adding espresso to chocolate. Thanks for the inspiration! I should visit your blog more often, that’s for sure. I totally missed your last two recipes – they are both stunning! But look at this easy bread – packed with chocolate and banana and it has such a great texture. Sometimes I see banana breads that are so dense, but yours looks great – totally gonna give this a try asap. Did someone say triple chocolate?! Your photos are absolutely incredible Olivia! I love your blog! This looks divine! Chocolatey, moist!!! Yum! wow amazing pictures. 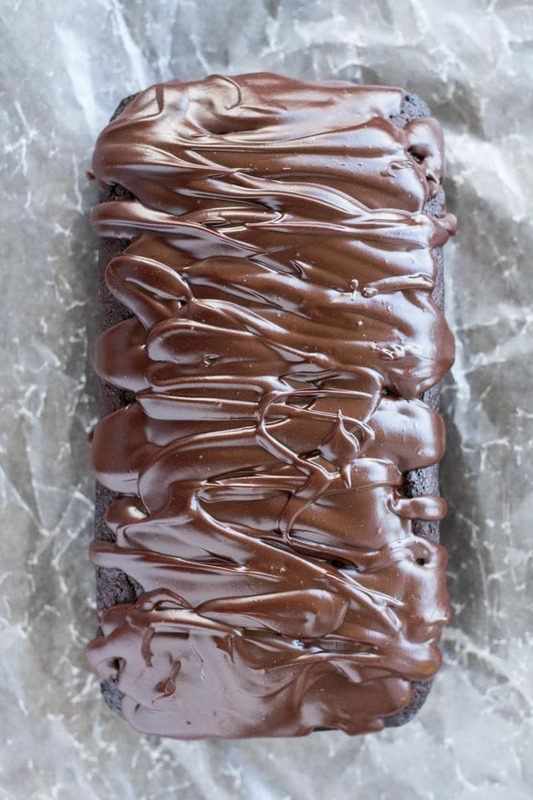 The chocolate banana bread look so tempting! Will you and this banana bread please marry me? ? 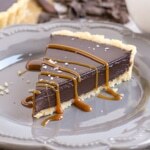 And…ganache should never be optional, haha ? Oh my goodness, this looks heavenly!! I love chocolate + banana combinations! This looks perfect! 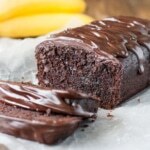 Two of my favorites – bananas and chocolate! I love this – thanks for the great recipe. That is a good idea, to freeze overripe bananas! But this is an even better idea–so much chocolate! 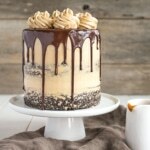 I’ll take a slice of this for breakfast 🙂 Love the ganache drizzle too. Thanks June! Freezing bananas is the way to go! They get ultra gross and mushy after thawing, but they are easier to mash that way :). I’ve not made this as yet, but very temping as I’ve had bananas in my freezer for a few months and forgotten about and they REALLY look gross, like mush in liquid. My question is – are they still OK to use? Hi Josephinne! YES, they are perfectly fine 🙂 Banana’s get mega-gross in the freezer. I usually just cut off and end and squeeze the banana out. Pretty picture, right? ;). Just mash them all up and you’re good to go. I almost never use fresh over-ripe bananas because I have so much in my freezer! Hi Josephine! YES, they are perfectly fine 🙂 Banana’s get mega-gross in the freezer. I usually just cut off and end and squeeze the banana out. Pretty picture, right? ;). Just mash them all up and you’re good to go. I almost never use fresh over-ripe bananas because I have so much in my freezer! This banana bread looks insane! I love all the chocolate ganache. It looks so decadent. Thanks Kathleen!! It’s one pretty intense bread ;). I’m EXACTLY the same! I’m so picky about my banana’s ripeness. I can’t eat them if they start to smell too sweet, and don’t even talk to me if they have a single tiny brown spot, oh no. Can’t do it. My bananas always end up in baking too, haha. Looks like I’ve found my newest way to eat bananas, though. Looks divine!